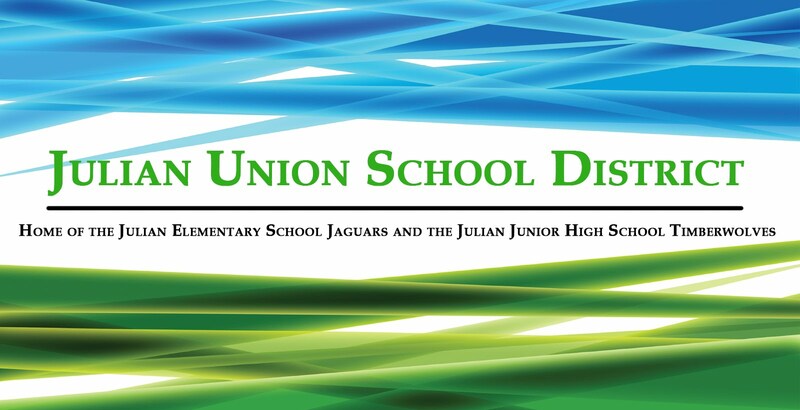 JULIAN UNION SCHOOL DISTRICT HAS A NEW WEBSITE!! Although nestled on the outskirts of the small rural mountain community of Julian, California, the Julian Union School District functions as the hub and center of the community. The school plays an integral part in the lives of the families, the neighboring businesses and the surrounding community. The quaint, rustic town of Julian is located sixty miles northeast of San Diego, and is an extremely popular tourist retreat throughout the year. Known as "the apple country", the old-fashioned, picturesque town's privacy and close knit community atmosphere is highly valued by the local townspeople, many of whose families have lived in the area for several generations. Julian Union is a school district consisting of one elementary and one junior high school with very little district office infrastructure. The superintendent's office is located on the elementary campus and he is in classrooms on a daily basis. Since the Julian Elementary attendance area encompasses 618.6 square miles, and it's boundaries go from the desert floor to the top of the mountain, the school buses provide the life line between students and the schools. The community income is derived mainly from cattle ranching, apple farming, and tourism. Many parents commute off the mountain to work in the city since the community has no large business or industry. The school district is the largest employer in the community. The population size has remained fairly constant over the last few years, although expectations for future growth loom on the horizon. While the town and school may be small and rural, the community has come to expect an educational program that is comparable with any in the city. The elementary school, which serves approximately 360 students, was established in 1921. While we do not have a large district organization to supplement our school level efforts, we believe that our staff of talented professionals have been able to develop curriculum and create programs for our students which would be the envy of many large districts. As one visits classrooms, it is apparent that there is much care, effort, talent, and creativity behind each student interaction. We are committed to our students, each other, and to our profession. We are committed to the continuous evaluation of our programs, to making improvements, and to striving for excellence in all that we do. The "team" effort of staff, parents, students, community and school board have created an outstanding learning environment for all students.